Ollo Ledo (Ourense). Deciding number one was easy. Hands down the best bar in Galicia. This is my Cheers and I am not lying; were I to walk in this evening, most people would know my name. The owner Xosé, perhaps the friendliest person I´ve met in Galicia, has run this legendary bar in the Plaza de Mercedes of Ourense for sixteen years. In addition to the hardworking staff and the friendly clientele, the music on rotation is top-notch, ranging from blues to Afro-Brazilian to classic rock-and-roll. The licor café is outstanding, Estrella Galicia flows on draught, bottles of Ribeira Sacra mencía and Ribeiro whites are readily on hand, and the occasional free pintxo helps tide you over until you head with the regulars to os viños to ir de tapear. Ollo Ledo is the reason why I miss living in Ourense. O Papuxa (Ribadavia). Is it a bar? It certainly isn’t a restaurant. Perhaps a tapas bar? Whatever it is, it is unique. The service is self-service, including the jamón. Yes, you have to cut your own slices of cured ham right from the bone. Once you get what you want, head the the open-air patio, set your food on a table, and sit down on one of the benches. Once you have washed down the food with a white Ribeiro–Ribadavia is the Ribeiro wine region capital–head to front to pay. The original owner asked you to pay what you thought it was worth. I was not in charge of the fondo that day so I do not know if the policy still holds. A Repichoca (A Coruña). The first time I went to this bar it was jam-packed with people watching a spontaneous group singing and playing pandeiretas (Galician tambourines). I instantly fell in love with the bar and knew if I ever moved to A Coruña, I would be a regular at this place. A Repichoca has a proud Galician character and an alternative culture. They do not have Estrella Galicia–rather, Super Bock from Galicia’s linguistic and cultural cousin Portugal–but the licor café is splendid. 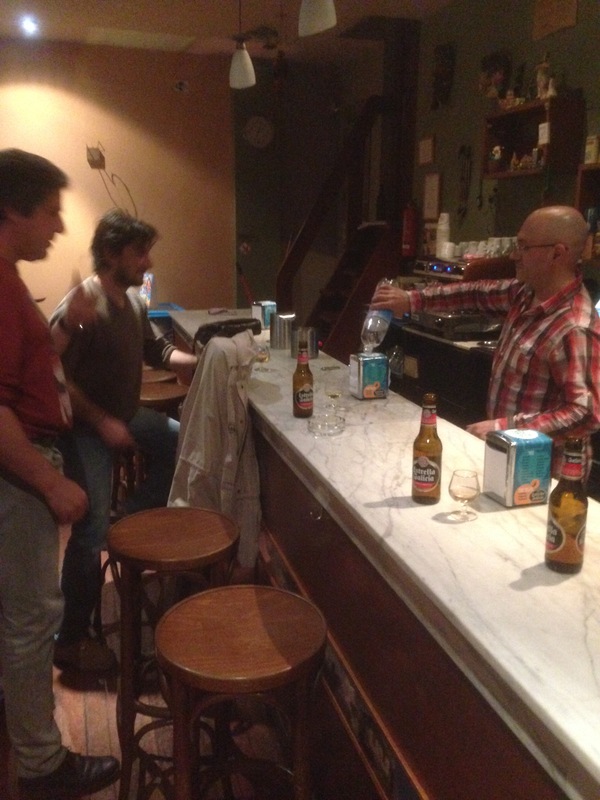 There are numerous quality bars on Rúa Orillamar in A Coruña–Patachim, for example–but A Repichoca takes the cake. A Viñoteca do Mercado (Santiago de Compostela). This wine bar is easy to find in the center of the main market in the old town of Santiago. They serve wine from all of the Galician D.O. 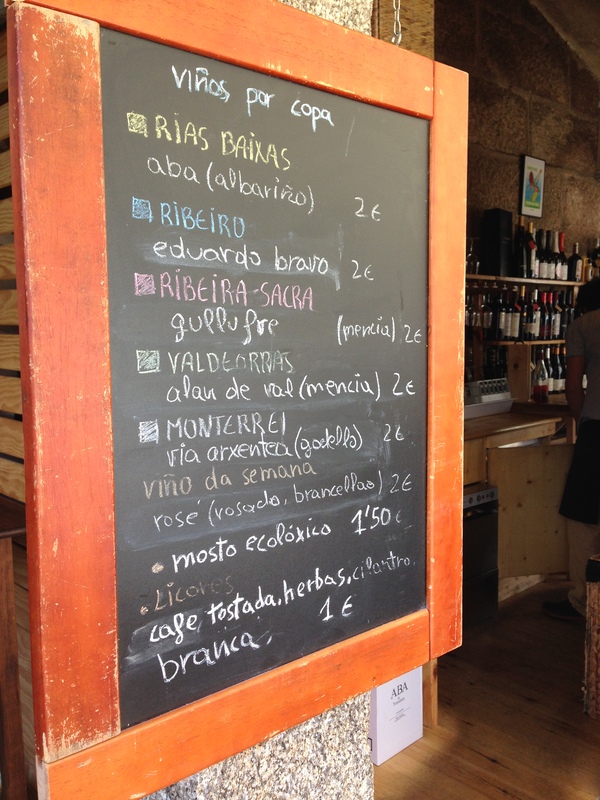 regions–Ribeira Sacra, Ribeiro, Rías Baixas, Monterrei, and Valdeorras–plus a good selection of licores. The best part is that there is a pulpeiro nearby selling pulpo a féira. You can get a small, medium, or large plate and bring it over to the wine bar–there no seats at the tables so you have to stand. Watch the busy market while enjoying the delicious Galician octopus with a glass of wine. El Café Cultural Auriense (Ourense). Tucked into the corner of the Praza do Correxedor, el Auriense has an alternative, counterculture clientele that enjoys the amazing view of the cathedral from its terrace. It hosts different cultural events and a lot of live concerts, such as the one where the glass table I was sitting at was smashed by a leadping lead singer. No harm, no foul. Make sure you get the good licor café. It is a great place! I need to go more often! The licor café is the best!